If evolution started over, how similar would its results be? Zach Zorich has an interesting piece at Nautilus asking if the world began again, would life as we know it exist? In less than five milliseconds, a Hydromantes salamander can launch its tongue—including the muscles, cartilage, and part of its skeleton—out of its mouth to snag a hapless insect mid-flight. Among amphibians, it is the quick draw champ. Frogs and chameleons are comparative slowpokes when it comes to their ballistic anatomies. “I’ve spent maybe 50 years studying the evolution of tongues in salamanders,” says David Wake, an evolutionary biologist at the University of California, Berkeley, “this is a particularly interesting case because salamanders, who don’t do anything fast, have the fastest vertebrate movement I’m aware of.” Within their lineage, evolution found a better way to accomplish tongue-hunting. Their seemingly unique adaptation appears to have evolved independently in three other unrelated salamander species. It is a case of convergent evolution—where different species separately developed similar biological adaptations when faced with the same environmental pressures. Salamanders are Wake’s go-to example when asked a decades-old question in evolutionary biology: If you could replay the “tape of life” would evolution repeat itself? In the salamanders, it appears it has: In other organisms, it may not have. Zorich’s piece describes some fascinating experiments testing this question, and is well worth reading in full. My own view is that this is really two separate questions. The first is how likely is the rate of evolutionary “progress”, or increases in complexity and capabilities? The second is, if those increases in complexity and capability did happen again at a similar rate, how similar would the results be to the ones we observe today? On the first question, I can’t see that it is at all guaranteed. There’s nothing to make us believe that the development of complex life was inevitable. It took billions of years on Earth. Viewed on geological timescales, complex life is a recent innovation. The Earth was 87% of its current age before the Cambrian Explosion took place. 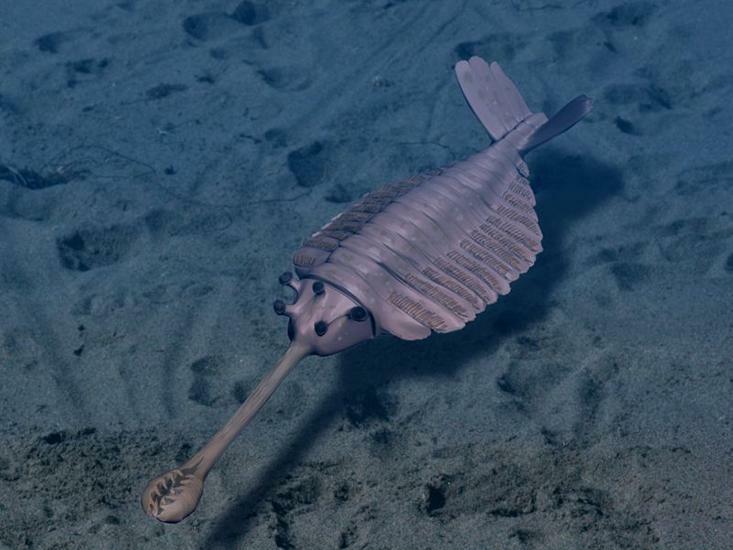 Complex life does predate the Cambrian, but 75-80% of the Earth’s age had elapsed before it developed. Earth probably only has another 500 million to 1 billion years before the sun’s growing heat makes life impossible. In other words, it took life most of the time it’s going to have (4 billion years out of a likely 5 billion year window) to evolve complex life. If we started over, it’s very possible that life would never get out of the microscopic phase in time. Of course, it’s also possible complex life might have developed earlier; we just don’t know. But if complex life did develop, and if the environment were the same, how similar would the results be to today’s life? I’m tempted to think that we’d see very similar ecological niches to the ones we have now. The many examples of convergent evolution would seem to bear something like this out. However, we have to remember that a large part of the environment is caused by life itself. The oxygen in the atmosphere first came about from early life, and the continued oxygen levels are maintained by life that outputs it as a waste product. Many of the optimal shapes for land animals are related to trees, grasslands, and similar life that they have to navigate through and around. Much of life lives in an environment generated by life itself, in the biosphere. If life started over, that biosphere would almost certainly be radically different. Still, broadly speaking, I would expect some functional similarities. For example, you’d still have life living in the water, and the same fish shapes that are conducive to moving through the water would be conducive again if life started over. Many of the same shapes that are optimal for moving over land surfaces would be optimal again. It would still be productive for species to eat other species in a food chain. It would still be optimal for sense organs to be in the front and highest part of an animal’s body. But within those broad functional niches, there would almost certainly be differences that we would find radical. For example, I see no guarantee that sexual reproduction would exist, or if it did that it would resemble anything we’re familiar with. While creatures that can regulate their own body temperature might exist, something like mammalian glands might never develop. Of course, all of this is speculation on my or anyone else’s part. As Zorich describes in his article, evolutionary experts are divided about it. Unless and until we have access to life that evolved independently in its own environment, in other words, until we have access to an extraterrestrial biosphere, we won’t really know. One point that I do think we can assess with high probability: if life started over, humans wouldn’t exist. Turn back the clock by 1% of Earth’s age (45 million years), and nothing resembling humans had evolved yet. Humanity’s existence is a very recent phenomenon, and civilization is a blink of the eye in geological time. Would some intelligence capable of a technological civilization eventually develop? Given the time constraints on complex life I mentioned above, and the amount of time it took a technology using intelligence to develop on Earth, it’s hard to say that it’s likely. Many people point to the other intelligent species out there, such as crows, dolphins, elephants, octopuses, and so on. With all those other intelligent species, wouldn’t it be likely that one or more of them would eventually evolve into a technology using species? And if so many intelligent species developed this time around, wouldn’t that make it likely that a technology using species would develop in a rewound world? The problem is that developing a technological civilization requires more than just brain power, it requires a body plan with enough dexterity to manipulate the environment. So far, primates are one of the few species groups, perhaps the only one, that has managed to develop this type of body plan, and only great apes (including humans) managed to pair this body plan with high intelligence, and only very recently in evolutionary time. I think the probability of life producing a technological civilization is very low. Given the existence of the Fermi Paradox, it seems reasonable to conclude that it is profoundly rare event. So, to summarize, if life started over, I think there’s a good chance complex life wouldn’t develop, but if it did, we’d see a lot of creatures that, from a distance, looked similar to the creatures alive today, but that would likely still be different in many ways hard to imagine. I think the probability of human level intelligence developing would be profoundly low. This entry was posted in Science and tagged Cambrian, Cambrian Explosion, Convergent evolution, Earth, Evolution, evolutionary biologist, Evolutionary biology, Extraterrestrial life, Fermi paradox, Human, Science, Zach Zorich. Bookmark the permalink. 3 Responses to If evolution started over, how similar would its results be? Interesting article. Thanks! The author does omit one observation that I often feel strongly when I read tranhumanism literature, that it is itself a type of religion, with too many people pinning their hopes for immortality on it. I obviously have some sympathy with the transhumanist outlook, and strongly feel that we should investigate the possibilities, but I’ve never been able to buy the semi-religious outlook of people like Ray Kurzweil. I’m not really familiar in much more than a very general way, but agree on the quasi-religious aspect given talk of immortality. I see there’s a fairly lengthy Wikipage on the subject – I’ll have to give it a look.